Protect-O-Flex | Pro Chem, Inc.
PROTECT-O-FLEX guards against damage caused by rain, humidity, chemical fume, oxidation and salt water. 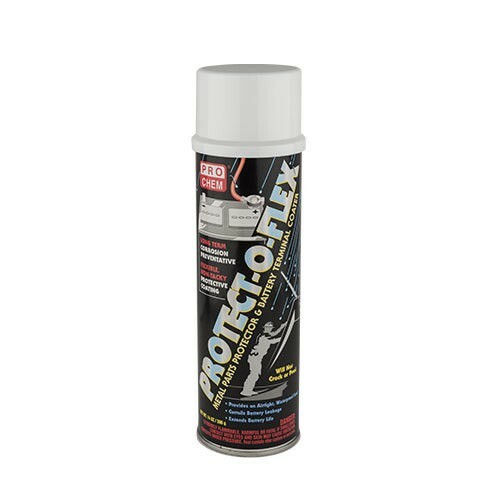 Protects surfaces and battery terminals for several months with a special water displacing corrosion inhibitor. Remains intact during flexing or expansion and contraction of base metal. Curtails battery leakage and extends battery life. PROTECT-O-FLEX works great on exposed equipment and parts in transit. Coating can easily be removed with mineral spirits or safety solvents. Do not use on painted parts. 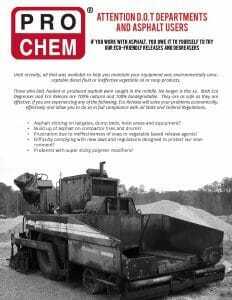 Clean object by removing rust, dirt, grease, oil and debris. Spray a thin, even coat over the entire surface and allow 5 minutes to set up. For more severe conditions, a second coat may be applied within several minutes. Complete setting of protective coating takes at least two hours. Can be flushed off easily with mineral spirits or safety solvent.